This is an event I always look forward to attending, not only because Martha's team knows how to throw a great party, but they do a great job of highlighting what's popular in the wedding industry, with focuses on independent designers. The party was packed. There was music, food, drinks and the perimeter of the space was lined with stations and vendors who specialize in some of the latest and hottest wedding trends out there right now. Who's that handsome man in the foreground? Oh, that's right, he belongs to me! Everyone working the event was decked out in white and all the party-goers were all gussied up. For me, it was fun getting to see what everyone was wearing and in some cases, how they styled their hair. What can I say, I'm a people-watcher by nature. There were all sorts of styled and delicious cakes, cookies, confections and other goodies to try. Andie's Specialty Sweets was one of the many Etsy businesses highlighted. Have you ever done a cleanse? Tim and I have gone vegan for 12 days before as a challenge (more on that here), but haven't yet crossed into cleanse territory. If it were to happen, I think Tim would be the first to try it — I'd probably turn into a grumpy monster, haha. Yes, that is a giant white stuffed tiger you see in the craziness above. We got a couple flipbooks of all of us and if I can figure out how to load them here on the blog, I'll share them when we do. It was definitely a great idea as both an activity and party favor to have for a wedding or any type of event, really. You could literally get manicures, brow sculpting, makeup airbrushing, and more right there at the event. They even had a Tattly booth with samples of personalized temporary tattoos you could get for your wedding. She was walking around with a stunning model showing off one of her latest dress designs that was so structural and whimsical at the same time. We said hello and chatted all things Etsy before she needed to scoot off to the next mob of people trying to get her attention. Find more of her mouthwatering designs in her Etsy shop. In related designer news, probably the most exciting part of the evening for me was running into Sarah Seven — yes the Sarah Seven. Sarah is one of the most creative dress designers I've ever seen and I love to tell everyone I know how I first came across and fell in love with her designs back when she had an Etsy shop. I've been following (more like stalking) her work ever since — just waiting in anticipation with each new line she produces. About 3 years ago in September of 2009, back when I lived in Brooklyn, I went to her spring 2010 fashion show during fashion week and ended up buying one of the most beautiful short sea-foam green party dresses from her at a sample sale she was fitting for the next day (I wrote about it here). To this day, it's still one of my most cherished dresses and way back when, I told her that when and if I got engaged, it would be a Sarah Seven that I'd wear for the big day. Funnily enough, I've been emailing back and forth over the past several months with the bridal boutique she sells her gowns through, Lovely Bridal, and had snagged a last minute appointment to try on a couple of my favorite designs. All of this background is to say how amazing Sarah is. 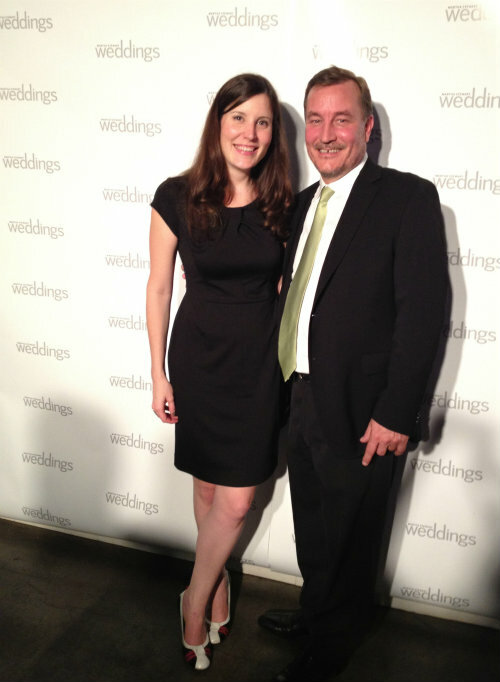 When at the Martha Stewart Weddings party, she actually recognized me and called over to me from where she was standing. I was starstruck, if you couldn't tell from the giddy smile in the photo above. I told her I couldn't believe she remembered me from those years ago and she told me she has an iron-clad memory. She asked if I still worked for Etsy and if I was still making jewelry and I was able to congratulate her on landing the latest cover of Brides Magazine and quite possibly scare her with all the things I know from following her work for so long. I was also able to personally thank her for flying in samples of the gowns I had my heart set on trying for my wedding that particular week (more gown details in this post, sorry for the non-specifics since Tim hasn't and won't see the dress til the big day — what I can say is I found and got the perfect dress). Needless to say, reconnecting with Sarah made my night. After all the fun and excitement, we went home, having had a blast, and with several MSW goodies including the latest magazines. 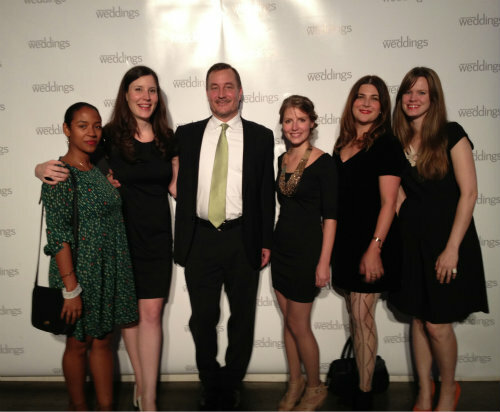 Thanks for such a fun party, Martha Stewart Weddings — you always know how to keep it classy! We hope to see you again this time next year if we're lucky! Thanks Monica — I'm really excited about it. Oh, Mary...we would have loved to have met in person! You were the first administrator to include us in a Etsy feature...so we've got heart strings...major. We know, it was a tricky night to navigate with everything to see. Andie and Jason — yes, we must connect on a future trip. Everything looks amazing and we had such a blast. How much fun!!! Especially when you are planning your own wedding! Lisa, it really was! Thanks so much.